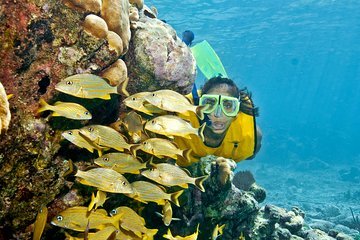 If you can’t get enough of the water and you’re a fan of snorkeling, this full-day snorkeling tour from Playa del Carmen is for you. Immerse yourself in three different ecosystems as you discover an ocean inlet, an underground river and a Maya cenote. From the Caribbean’s tantalizing blue waves to river waters in the Riviera Maya jungle, an array of exotic marine life awaits you. Enjoy a hearty buffet lunch between snorkeling stops and snap memorable shots of your jungle and ocean adventure. Hotel transport included. Wonderful day... would have been even better if we had seen some more wildlife in the more open waters but you can't make nature dance to your tune on the day! Underground cenote beautiful... the water was so clear!